A cathode-ray tube is a component used in television picture tubes, oscilloscopes, and display screens in radar sets and computers, although now largely replaced by flat-screen devices. It consists of an evacuated glass tube containing at one end a heated cathode and anode, and widened at the other end to form a flat screen, the inside of which is coated with a fluorescent material. 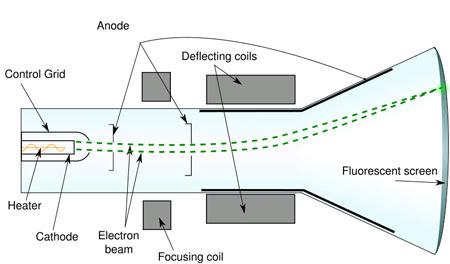 Electrons emitted from the cathode are accelerated toward the anode, and pass through a thin hole in its center to form a fine beam which causes a bright spot where it strikes the screen. Because of the electric charge carried by the electrons, the beam can be deflected by transverse electric or magnetic fields produced by electrodes or coils between the anode and screen: one such set allows horizontal deflection, and another vertical. The number of electrons reaching the screen can be controlled by the voltage applied to a third electrode, commonly in the form of a wire grid, placed between the cathode and anode so as to divert to itself a proportion of the electrons emitted by the former. It is thus possible to move the spot about the screen and vary its brightness by the application of appropriately timed electrical signals, and sustained images may be produced by causing the spot to traverse the same pattern many times a second. In an oscilloscope, the form of a given electrical signal, or any physical effect capable of conversion into one, is investigated by allowing it to control the vertical deflection while the horizontal deflection is scanned steadily from left to right, while in television sets half-tone pictures can be built up by varying the spot brightness while the spot scans out the entire screen in a series of close horizontal lines. The iconoscope was a type of cathode-ray tube, invented by Vladimir Zworykin and used in early television cameras. Light entering the tube strikes a photographic plate, causing the plate to become positively charged. The other side of the plate is scanned by a beam of electrons from an electron gun. Those electrons not held in the plate bounce back to be collected and transmitted as the television signal.